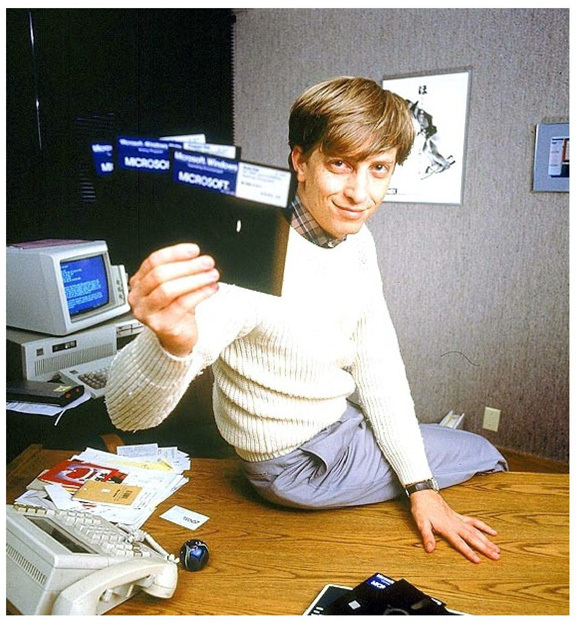 Being Retro: Bill Gates and the More Simple Days for Data... or Chicks Don't Want to Know About Your FLOPPY! Bill Gates and the More Simple Days for Data... or Chicks Don't Want to Know About Your FLOPPY! A floppy disk, or diskette, is a disk storage medium composed of a disk of thin and flexible magnetic storage medium, sealed in a rectangular plastic carrier lined with fabric that removes dust particles. They are read and written by a floppy disk drive (FDD). Floppy disks, initially as 8-inch (200 mm) media and later in 5.25-inch (133 mm) and 3.5-inch (90 mm) sizes, were a ubiquitous form of data storage and exchange from the mid-1970s well into the first decade of the 21st century. Wow I keep telling you how my friends are really cool and I am not kidding, I filled the spots needed to my "Book Tour" in less than 48 hours. For me that is awesome, cause I thought I would be sharing my books with myself thinking about how it would be neat to have friends. Thank you all, I am adding a few more dates to main list and very soon the master. Long title, but sadly true... I am right? That is awesome you filled the slots! That's so cool you filled your slots! Way to go, bro. I remember playing games on floppy disk. I think one of them was a Mission Impossible game. Congrats on filling the slots. darn it! all filled! thats what i get for being late to the party! as usual.